A boutique inn needed an updated website. 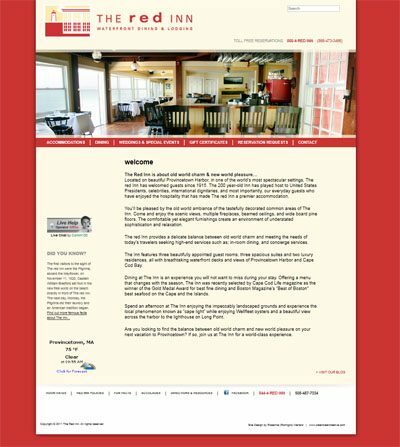 The Red Inn, a boutique inn, located in Provincetown Harbor, Massachusetts, on the tip of Cape Cod, needed an updated web site to allow visitors see the rooms, room rates, dining menus and support their marketing efforts. Working closely with the client and a graphic designer a beautiful website design with slide shows and static photographs was created. The WordPress CMS was chosen so the customer could easily update the website themselves. A custom database was created so the customer could update room rates for the different travel seasons on Cape Cod. Links to a reservation system, online help, and social media were also included.